Beginning at the junction of US 75 approximately 1480 feet south of the NW Corner Section 4-T92N-R45W; thence in an easterly and northeasterly direction through Section 4-T92N-R45W and Sections 33, 34, 27, 22, 23, 24, 13 and 12-T93N-R45W and Sections 7 and 6-T93N-R44W to the Plymouth-Sioux County line at a point approximately 770 feet west of the NE Corner of said Section 6-T93N-R44W, Plymouth County (SE Corner Section 31-T94N-R44W, Sioux County). Due to a review of our Primary Road System Records, Iowa 60 in Plymouth County should be deleted and the new description added and should be officially included into the primary system. Iowa 60 begins on 5th Avenue at Plymouth Street (junction Iowa 3); and travels north and northeast to the Plymouth‑Sioux county line approximately 11 miles west of the NE corner of Plymouth County. It is recommended to approve deleting the present description of Iowa 60 in Plymouth County from the Primary Road System and approve including the attached new description of Iowa 60 in the Primary Road System. Beginning at the junction of US 75 approximately 370 feet north of the SW Corner Section 4‑T92N‑R45W; thence in a northeast direction through Section 4‑T92N‑R45W to a point on the west side of the Chicago and Northwestern Railway on the north line of said Section 4; thence in a general northeast direction along the west side of said railway and substantially parallel thereto through Sections 33, 34, 27, 26, 23, 24, 13 and 12‑T93N‑R45W and Sections 7 and 6‑T93N‑R44W to the Plymouth‑Sioux County line at a point approximately 700 feet west of the NE corner Section 6‑T93N‑R44W, Plymouth County (SE corner Section 31‑T94N‑R44W Sioux County). 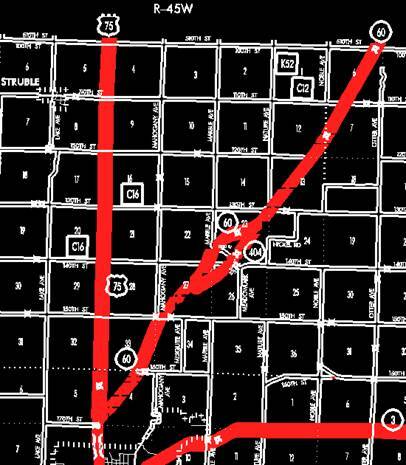 Beginning on 5th Avenue at Plymouth Street (junction Iowa 3); thence north and northwest on 5th Avenue to the north corporation line. Beginning on the north corporation line of Le Mars connecting with 5th Avenue; thence northerly following substantially the section line of Sections 9 and 4‑T92N‑R45W to a point (junction US 75) approximately 370 feet north of the SW Corner Section 4‑T92N‑R45W; thence in a northeasterly direction through Section 4‑T92N‑R45W to a point on the west side of the Chicago and Northwestern Railway on the north line of said Section 4; thence in a general northeasterly direction along the west side of said railway and substantially parallel thereto through Sections 33, 34, 27, 26, 23, 24, 13 and 12‑T93N‑R45W and Sections 7 and 6‑T93N‑R44W to the Plymouth‑Sioux County line at a point approximately 700 feet west of the NE Corner Section 6‑T93N‑R44W, Plymouth County (SE Corner Section 31‑T94N‑R44W, Sioux County). Due to a review of our Primary Road System Records, Iowa 60 in Plymouth County should be deleted and the new description added should be officially included into the Primary System. Iowa 60 begins north of Le Mars at US 75 and travels northeasterly to the Plymouth‑Sioux County line approximately 11 miles west of the NE corner of Plymouth County, Iowa. 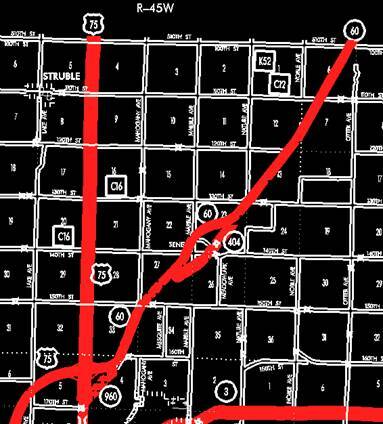 Beginning on an unnamed street at Plymouth Street (junction Iowa 3); thence northerly and northwesterly to the north corporation line connecting with an unnamed street. Beginning on the north corporation line of the City of Le Mars connecting with an unnamed street; thence northerly following substantially the section line of Sections 9 and 4‑T92N-R45W to a point (junction US 75) approximately 370 feet north of the SW Corner Section 4‑T92N‑R45W; thence in a northeasterly direction through Section 4‑T92N-R45W to a point on the west side of the Chicago and Northwestern Railway or the north line of said Section 4; thence in a general north­easterly direction along the west side of said railway and substantially parallel thereto through Sections 33, 34, 27, 26, 23, 24, 13 and 12‑T93N‑R45W and Sections 7 and 6-T93N‑R44W to the Plymouth‑Sioux County line at a point approximately 700 feet west of the NE Corner Section 6‑T93N‑R44W, Plymouth County (SE Corner Section 31‑T94N-R44W, Sioux County). NOW, THEREFORE: Be it resolved that the Iowa Department of Transportation approve the location of Iowa 60 in Plymouth County, Iowa. Beginning on the north corporation line of the City of Le Mars, connecting with Fifth Avenue West; thence north following substantially the section line to a point near the SW Corner Section 4‑T92N‑R45W; thence in a northeasterly direction to a point on the west side of the Chicago, St. Paul, Minneapolis and Omaha Railroad on the north line of Section 4‑T92N‑R45W; thence in a northeasterly direction along the west side of said railroad and substantially parallel thereto through Section 33, 34, 27, 26, 23, 24, 13 and 12‑T93N‑R45W, and Section 7 and 6‑T93N‑R44W to the Plymouth Sioux County line at a point approximately 700 feet west of the NE Corner Section 6‑T93N‑R44W, Plymouth County (SE Corner Section 31‑T94N‑R44W, Sioux County). Beginning at the intersection of Fifth Avenue W and Plymouth Street; thence northerly on Fifth Avenue W to the north corporation line.